This is a nice set of down pillows. The cover seem to keep the feathers from poking through better than some other brands but I would like to see a little more density as they squish down a lot. Maybe buying the next size up from your pillow covers would give them a little more plumpness. Overall a nice product for a great price. If you found the perfect pillow sham to match your decor, but need a filler - look no further. 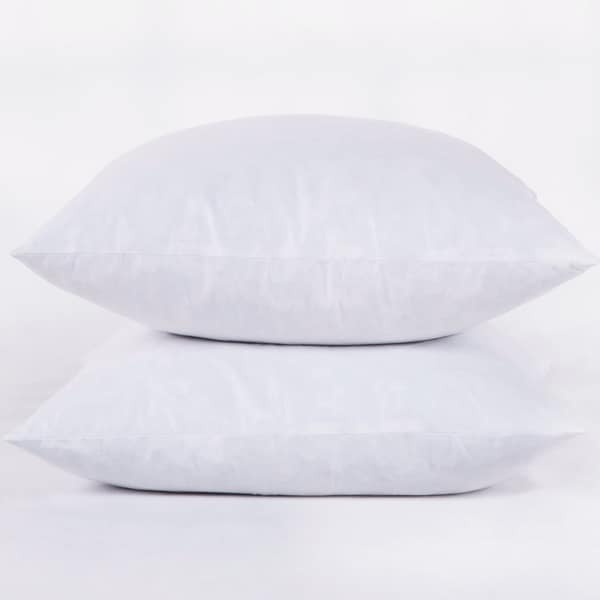 This luxury, natural filled pillow set provides hotel quality support, comfort, and quality. Crafted with 100 cotton face and filled with 95 duck feather and 5 down. Pillows are made from 100 cotton. Filled with 95 duck feather and 5 down. Spot Clean, Dry Clean Recommended. Materials are Responsible Down Standard certified and cleansed by Oxipower technology. Dimensions 20.0 In. X 12.0 In. X 3.0 In. I needed these for my Euro shams. They are a nice quality but not firm. Seem to be well made all over. Would be comfortable for sleeping on though. They fit perfectly in a 26 inch sham case. I should of bought firmer ones for my purpose. they are nice euro pillows for the price. you can fluff them up nicely but they are not as full as I wished they'd be. Still a good buy and I will keep them. Needed these pillows for my shams I recently got and they have such great reviews so I bought them. These pillows are a good value but they are very flat. They don’t seem to have the fullness that I have seen in other pillows that are similar. Love the pillow inserts, although they do not plump up as much as the picture shows, it does work for me though. I’m he price was good and getting them as a pair was great! Perfect for my euroshams. Easy to fluff back up.